Transes Européennes was a small French label established in the mid-1990s by percussionist Pablo Cueco, aimed at releasing “the works of artists who include in their creative approach the existence of other cultures”. They were short-lived and issued no more, I think, than 30 recordings, most of them, apparently, devoted to contemporary jazz/world music crossover. A few of those have been of interest to me, the ones with music by the Greek-French composer and pioneer of “théâtre musical” Georges Aperghis (Triptyque, Parcours), and those of percussionist Jean-Pierre Drouet (himself early on associated with Aperghis and music-theatre), Jean-Pierre Drouet Solo and Les Variations D’Ulysse. 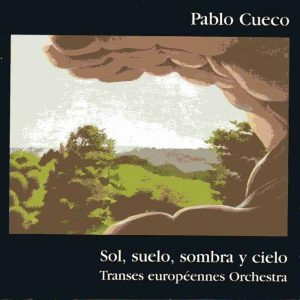 So I thought I’d explore more when prices were cheap enough to make the exploration risk-less, and this CD of Pablo Cueco’s own music seemed the perfect choice. 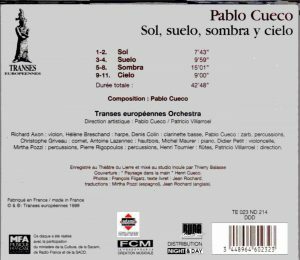 Here – the title means Sun, Ground, Shadow & Sky – Cueco is credited as percussionist (playing the Brasilian berimbao and the North-African zarb, which, incidentally, is also a French slang word for “bizarre” = “zar-bi” = “zarb”) and artistic director of the Transes européennes Orchestra conducted by Patricio Villarroel. The orchestra is sizeable and its layout makes it closer to an ensemble of classical contemporary music rather than to a jazz combo: violin, cello, flute(s), oboe, bass clarinet, cornet, harp, piano and a vast array of percussions played by three players. The music sounds like a combination of free jazz, with some whiffs of world music (especially in the very “African”-sounding percussion of track 7, Sombra III, and track 10, Cielo II, and in the Mid-eastern-sounding cello passage of track 8, Sombra IV), and the kind of crossover of dance music and contemporary exemplified by composers like Steve Martland or Graham Fitkin. It is sometimes invigoratingly rowdy, with some invention in timbres (at the beginning of track 5, Sombra 1, with what sounds like a low-ranged foghorn – I’m not sure which instrument(s) produce(s) that sound, a bass flute? Amateurs of free jazz and the kind of contemporary dance music illustrated by composers like Steve Martland may have an interest for this. TT 43 minutes.